Graeme McDowell wonders what might have been as he walks off the 18th at Royal Lytham and St Annes. 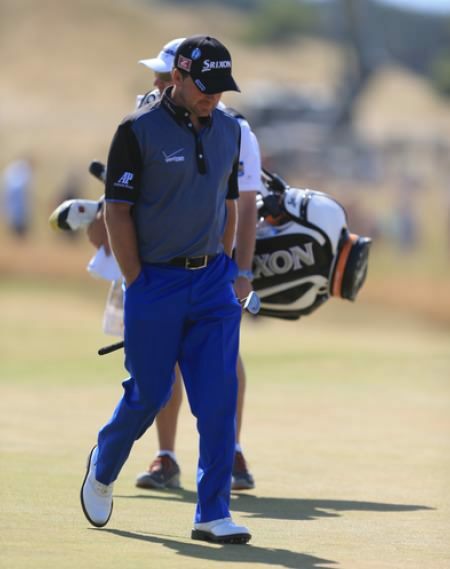 Photo Eoin Clarke/www.golffile.ieGraeme McDowell insisted that he was not “splattered on the floor” following his second successive major championship disappointment. But after watching playing partner Adam Scott implode coming down the stretch and hand the Open to Ernie Els, the 32-year old Portrush man was left to wonder what might have been after another slow start in the final group at a major. In hindsight, a final round 70 would have been good enough to force a play-off with Els, but McDowell made too many mistakes and while he was just three shots behind Scott with 10 holes to play, bogeys at the ninth, 10th and 11th ended his title challenge. Tied for fifth with Luke Donaldin the end after a closing 75, five shots behind the winner, McDowell was left to wonder why he had not come charging out of the starting gate. A bogey at the second, where he opted not to hit driver and found a fairway bunker with a three wood, handed the momentum back to Scott, who followed a bogey at the first with an imperious birdie there. McDowell had escaped with a par save from left of the green at the opening hole but while Scott bogeyed the third, the Rathmore man could never get closer than three strokes and his challenge faltered fatally around the turn. Safely in fairway with his drive, he came over the top and hit his second straight left into deep jungle when going for the green. Lost ball. Lost championship. Graeme McDowell commiserates with Adam Scott on the 18th. Photo Eoin Clarke/www.golffile.ieAfter a fruitless search for his golf ball, he was ferried back to the fateful spot in a buggy, picking thorns out of his pants. “It’s the longest walk in golf, and believe me, the cart ride doesn’t make it feel any shorter,” he said. “It was gone for me. Bogeying nine and ten, that was pretty much the key for me. “I made a great birdie on eight. I stormed to that ninth tee box. I executed a shot which, you know, was just the wrong golf shot in the end. I misjudged the wind by at least ten yards, make bogey there and made a decent drive on 10 which just catches the wind. Going back to his second shot to the 11th, he said: “It was a case of trying to be very aggressive with my second shot and trying not to go right. And I went straight over the top of it. That’s my bad move. I spin out very hard, move my body left in attempt not to get the club flailing right, and that was just a bad pull, 15 handicapper. Card wrecker. He seemed misty eyed at time as stood on a dias in the mixed zone, his girlfriend watching from afar with a concerned look. “What did I have to do today, shoot level par?” he asked, shaking his head. “It was a tough day. It was a tough day. McDowell was adamant that he would not be beating himself up too much over his latest major disappointment. Yet he admitted that he had some questions to answer. “I appreciate Pebble Beach every day of my life,” he said when his 2010 US Open win was mentioned. “Knowing that my name is on the US Open trophy forever is a special feeling. Graeme McDowell assess his shot on the bunker at the sixth. “The second to six was a killer blow. I hit a good shot in there and finished unplayable in the bunker.” Photo Eoin Clarke/www.golffile.ie“But still, going into the last round of both the US Open and The Open Championship this year with chances to win, getting off to flat starts both days, I’ll be analysing why. “It’s not far away, though. Taking the positives away from today, you can’t buy that type of education I’ve just had today and that education I had five weeks ago at Olympic. You just can’t buy that. “I’ll bank those experiences and I’ll move on and just know that if I keep putting myself in contention that someday it will be my day. “I don’t like to blame luck. It’s not about luck. But the first nine holes at Olympic and the first nine holes today, I just didn’t get the rub of the green. Asked about Scott, who bogeyed the last four holes to shoot 75 and lose by one to Ernie Els, he said: “What can you say? It was tough to say anything to him that was going to be of any relevance. I said he’s a great champion and I said there’s many majors ahead for him. It’s just a tough beat. “He struggled on the greens a little bit today, as we all did. The putt on 16 was huge for him, to miss that. He hit a great drive down the middle of 17, and half of England right of that pin, and he missed it left. “The 18th is a tough tee shot, let’s be honest. So he’s going to be extremely heartbroken and disappointed, but he’s a great, great, great player, and that’s what I tried to convey to him on the last green. “Like I say, it felt like a futile exercise trying to say anything to him, but I’m sure he’s going to be unbelievably disappointed. “He played solid. I really wasn’t paying a huge amount of attention to leaderboards, but I was aware that Els was making a run. We heard a roar and I assumed he’d birdied the last, as Adam was obviously bogeying 16 and making a cardinal mistake on 17. Like I say, he’ll be heartbroken right now. “I was watching out of the corner of my eye. I wouldn’t say I had given up and was intent on Adam Scott was doing. I was still fighting to try to post a good finish for myself. “I struggled with my golf swing a little bit today. But it’s hard to watch. It’s hard to watch a guy do that. When he hit that second shot [long] on 17 and the alarm bell started to ring, I thought, hold on, we’ve got a problem here. “And like I say, he was unconvincing on the greens today. They were tough to putt. A little bit of wind coming across them. And that putt on 16 which horseshoed on him was the start of a kind of series of events that he’ll think about a lot tonight. “It was four feet. I said to him when he hit his putt up I said, good putt. And he didn’t respond. And it was, it was kind of one of those, he had left himself a bit of a kneeknocker. “It’s the return of one of golf’s great champions who’s had a very indifferent three or four years. Apart from his win at Doral, I can’t really think of many real highlights for a guy who is a classy, classy golfer. He’s a great champion. “I mean, fourtime major champion. Great to see guys like that at the top of world golf. He’s a pretty good role model for young kids and golfers. He’s good for the game of golf. Never bad to see champions like him. As a consolation prize, McDowell moved up to fourth in the Race to Dubai rankings with €1.51m after earning a cheque for €246,324. He looked bitterly disappointed but denied he would have to pick himself up off the floor. “No, I’m not splattered on the floor right now in disappointment,” he said. “I’m just a little frustrated that I got off to flat starts both times now in the last rounds of majors. “Like I say, I’ll address some scenarios that I feel I can do better. But I’m taking the positives away. I’m not beat up at all right now. I’m disappointed, yes. But I’m fine. Caddie Ken Comboy earned his keep at Sandwich on Thursday. (Photo Eoin Clarke/Golffile 2011Graeme McDowell confessed that his caddie talked him down off the ledge as he went from zero to hero to keep his Open hopes alive. The former US Open champion was ready to explode as he made a horrific start, crashing to three over early on following a double bogey at the first and a bogey at the fifth. But with bagman Ken Comboy whispering words of encouragement, G-Mac racked up six birdies in his next 12 holes, storming home in a best-of-the-day 31 to card a two under 68 and finish the day tied for sixth with Darren Clarke. Relieved not to blow his Claret Jug dreams, McDowell said: “You’ve got to really rely on your caddie and I’ve got to thank him a little bit out there today for keeping me in the moment because my head was spinning after a few holes. Graeme McDowell slashes his way out of the rough on the 14th. 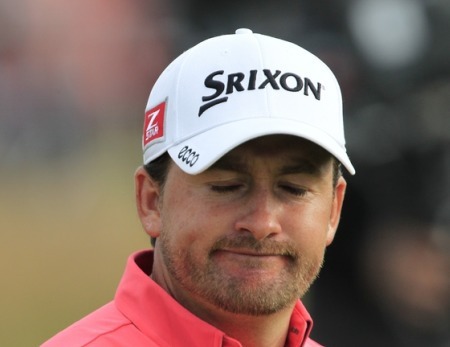 Photo Eoin Clarke/www.golffile.ie Graeme McDowell is wary of the “sleeping giant” that is Royal Lytham despite taking advantage of benign early conditions to shoot a three under 67 and lurk just three shots off the lead. Graeme McDowell raises his fist after his birdie at the 17th. Photo Eoin Clarke/www.golffile.ieGraeme McDowell insisted he’d be drawing inspiration from boyhood hero Seve Ballesteros when he chases Open Championship glory at Royal Lytham today.